Half of consumers prefer shopping local to visiting out-of-town shopping centres. The overall experience heavily factors into where they shop, meaning a failure by shopping centre managers to adapt the environment will inevitably lead to a loss of market share. CBRE commissioned the groundbreaking ‘How Consumers Shop 2014’ report, surveying 21,000 shoppers in 21 European countries. When it comes to consumer motivation, the high street wins on price and convenience – as well as the presence of independent shops and speciality retailers. Over half the people surveyed travel 15 minutes or less to their favourite shopping spot when it comes to non-food shopping, so it clearly pays to concentrate on attracting local customers. This week, Regent Street in London launched in-store Beacons that connect shoppers with loyalty discounts in real-time. Commissioned by The Crown Estate, Regent Street is the first shopping street in Europe to launch a co-ordinated effort across retailers, using a mobile app and Bluetooth Beacon technology. The contemporary battleground for shopping centre market share is increasingly focusing on what a shopping centre can offer in addition to pure retail sales – food and beverage, entertainment, and events – all designed to create compelling experiences for shoppers. 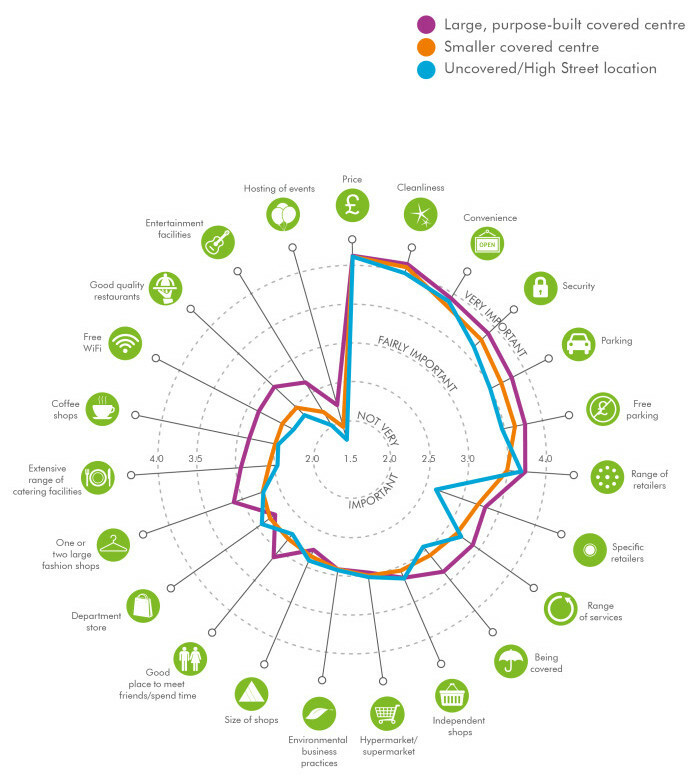 The survey found three major shopping trends split by geography. ‘European Mainstream’ – Europe’s core retail markets, including Britain along with France, Germany and Poland. ‘Shopping Centre Socialites’ – Ireland falls under the Mediterranean trend, who see shopping centres as ‘good places to meet friends’. ‘Utilitarian Consumers’ – Scandinavian countries who value cleanliness and retail mix over additional events and activities. More broadly, 90% of consumers prefer to visit shops to buy, rather than purchase online. A minority – less than 20% – use tablets or smartphones during the buying process. Out-of-town malls are looking to trends in urban cores. Diversification and innovation are high on the agenda – with “business hub” work spaces about to open at Meadowhall. We Are Pop Up launched the Pop Up Village at the Corio’s Boulevard Berlin earlier this year. The village shows what’s possible in shopping centres beyond traditional leased retail, providing emerging fashion labels with instant access to consumers. These brands in turn provide consumers with fresh, engaging content. The Pop Up Village showcases how shopping centres can embrace the innovation currently rising on High Streets.